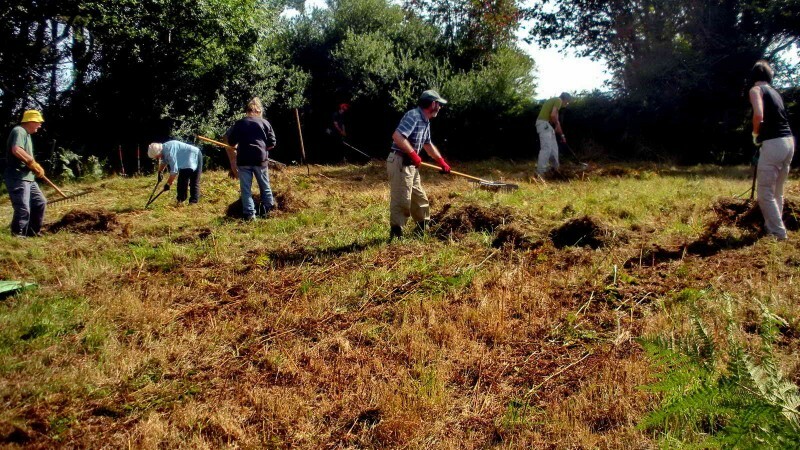 Starting with a bright sunny day, DPA and Devon Wildlife Trust volunteers met at Pudsham hay meadows to rake bracken on Wednesday 24th August. The three meadows were recently acquired by the DPA as its fourth land-holding. 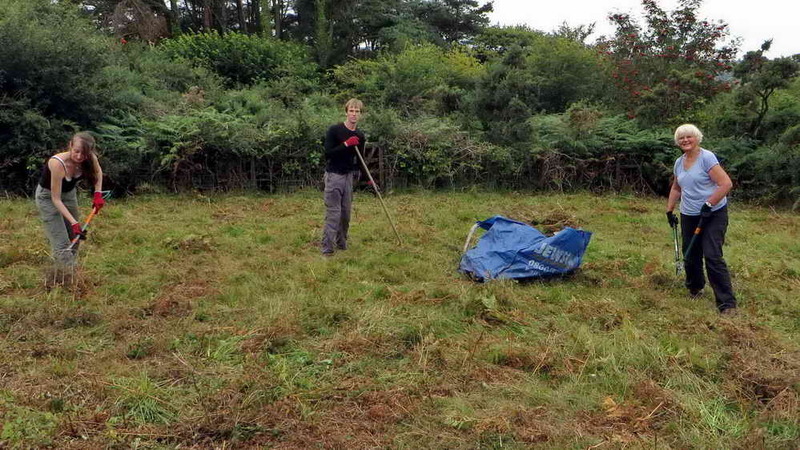 The work objective was to rake up dried bracken. By the time a lot of the work had been done, I set about taking some photos – after the cloud had come over and turned the scene into quite a dull one for the photos! 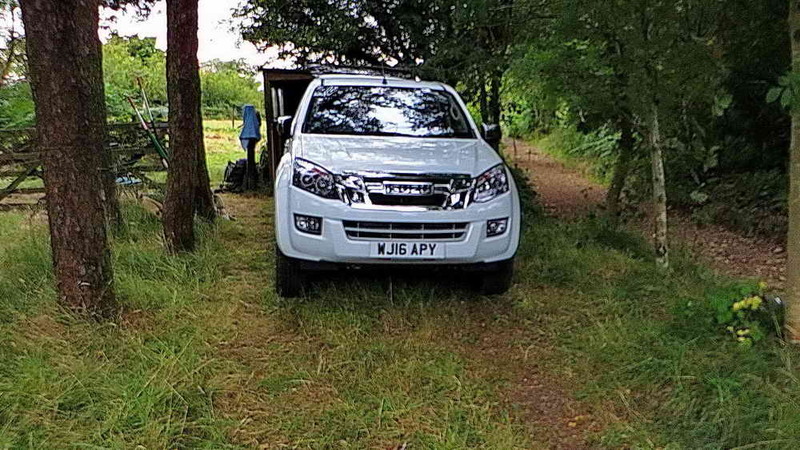 The DPA ‘Appy wagon on site. Following the flowering season, the bracken had grown to quite a height and was then cut by a DNPA works team about two weeks previously. The group set about raking the dried bracken into piles that were transported to nearby dumping sites where it could rot down. 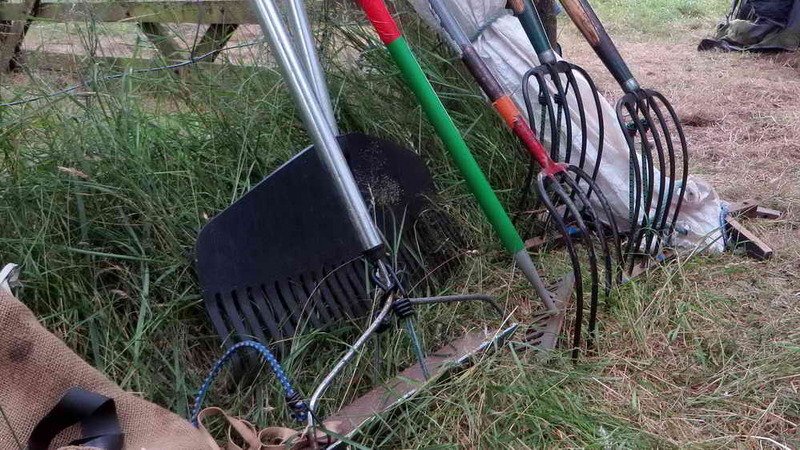 A selection of raking tools. The DWT supplied a selection of rakes and forks. 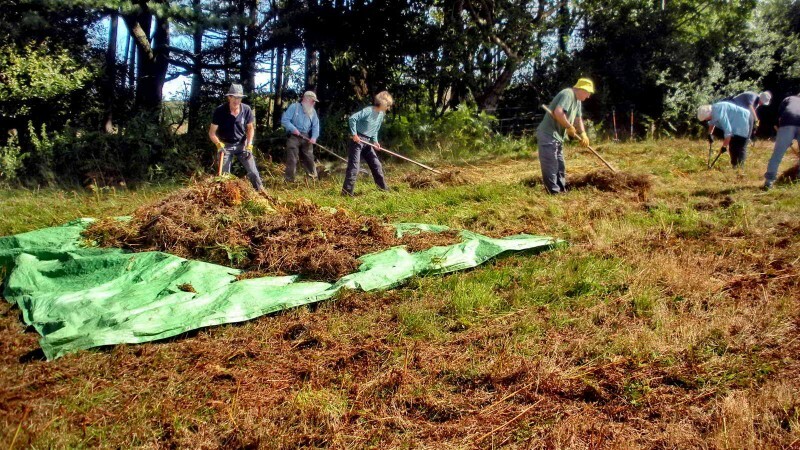 The DPA also had tools, including a brush-cutter that was used to cut around the edges of the three meadows, where the tractor had been unable to cut. 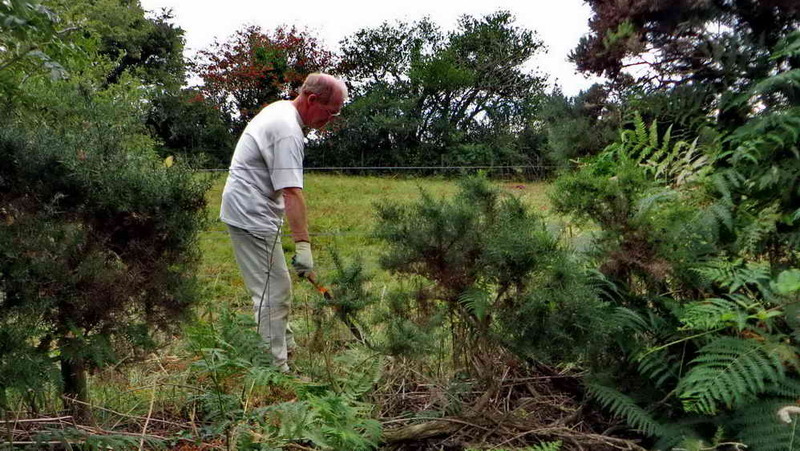 First, the bracken was raked into piles ….. Working in the first field -1. Then, it was gathered onto tarpaulins or into drag bags for removal ….. Working in the first field – 2. 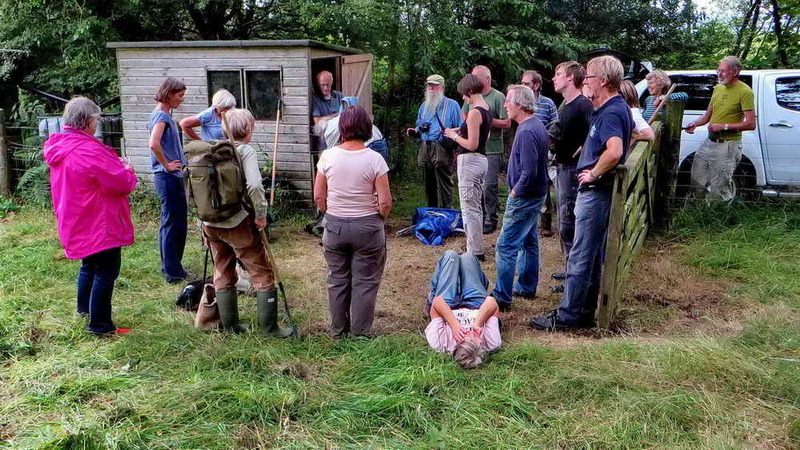 The work was co-ordinated by Naomi Barker, the DNPA Ecologist. It was interesting to see the range of rakes – from modern, wide aluminium ones to traditional wooden models. I took along my father’s old rake that was made by a blacksmith in St. Erth, Cornwall, that he used on the farm in Hayle, Cornwall, at least seventy years ago! People remarked on it being a bit “skew-whiff“, but that is how it always was! 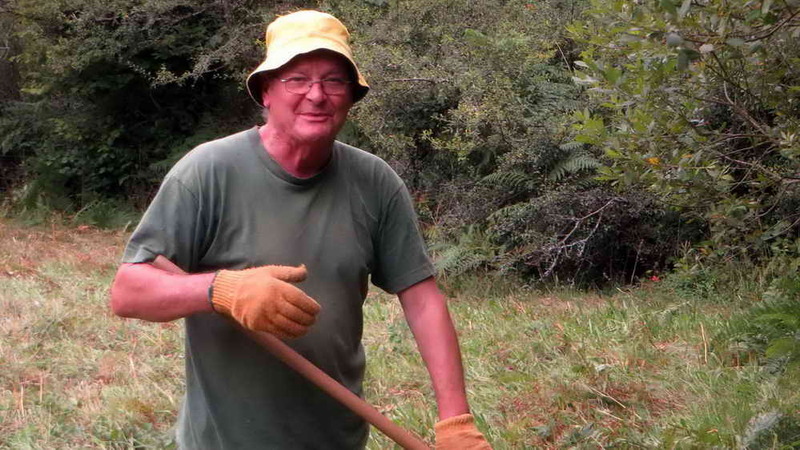 Besides the raking, loppers were used on some vegetation. 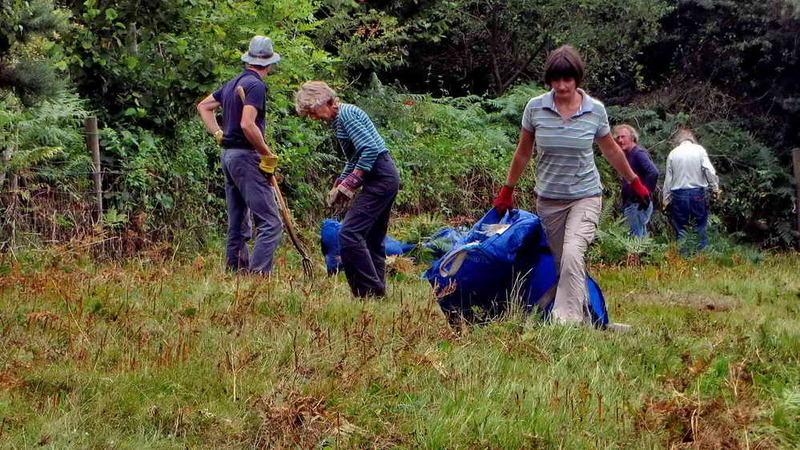 While one group was working in the first field, other volunteers started in a neighbouring one …..
As is seen in the photo above, both drag bags and tarpaulins were used to collect and remove the bracken. Later in the year, a number of ponies will be used for conservation grazing and these will need to be securely penned in, in the meadows. To this end the fences and gates need to be in good order ….. The opportunity was taken during the day to look at the gates and this one, in the photo above, needed some adjustment to its hinges. 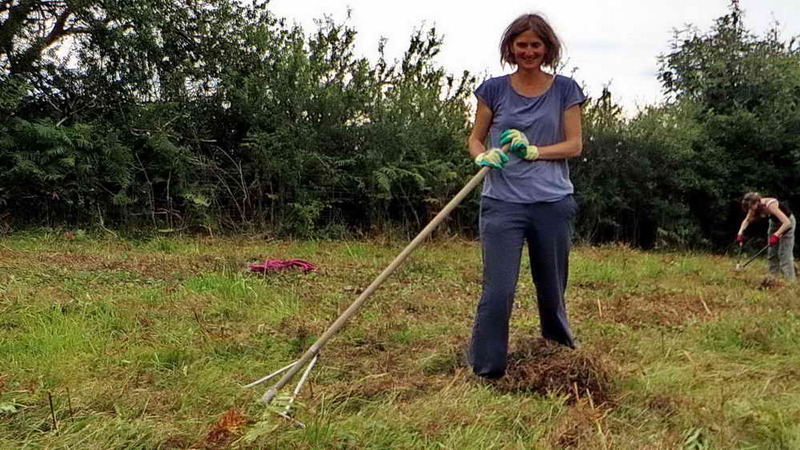 Not all rakes stand the test of time! 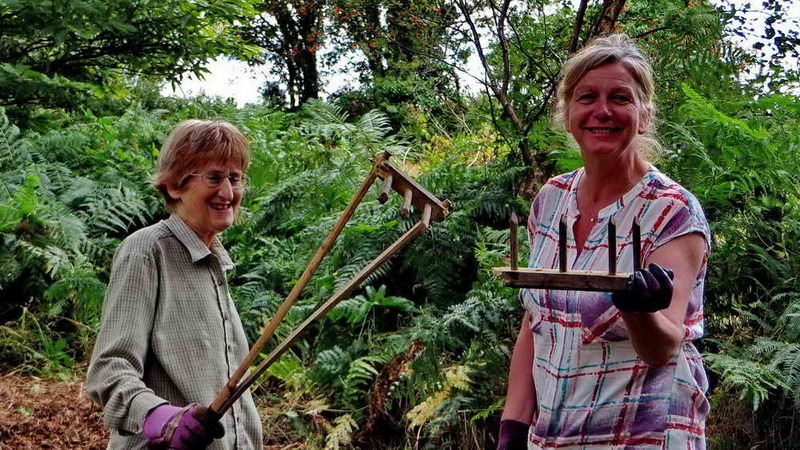 One volunteer ended up with a newly formed three-toothed rake, useful for the strawberry patch? By mid-afternoon, the work was mostly done. The meadows are blessed with a plethora of wild flowers that are typical of old hay meadows, and this is why the DPA has bought them, so that they may be preserved and enjoyed into the future. 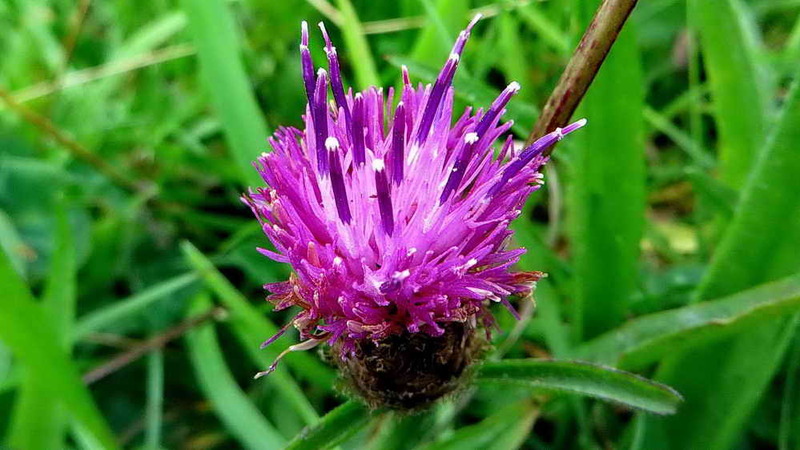 The photograph above shows an example of Knapweed, Centaura nigra. The gathering at the end of the day. 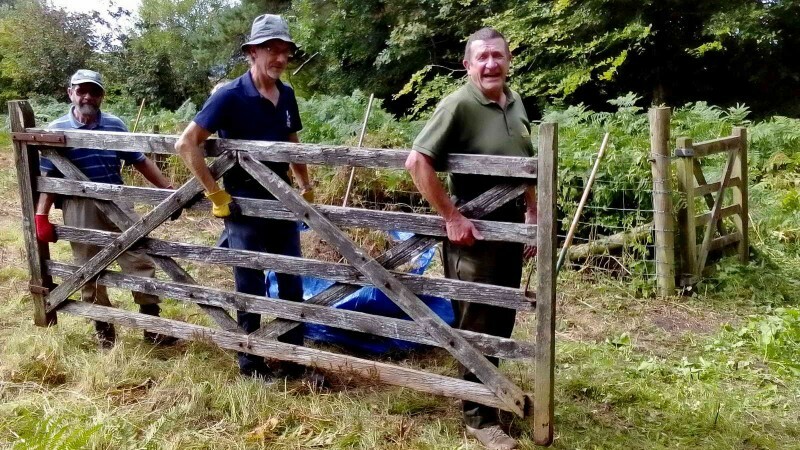 This was a day during which a lot of work was accomplished and the DPA thanks the enthusiastic volunteers of Devon Wildlife Trust – they have been doing this job for many years already. 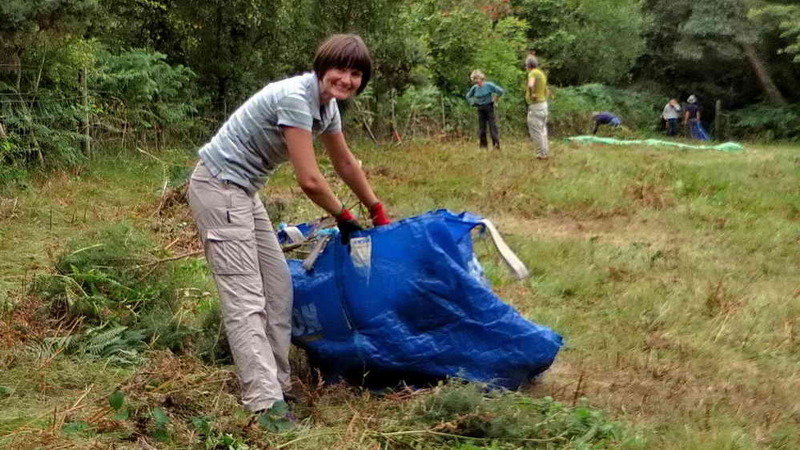 The DPA also thanks them for their offer to help again in the future, it is greatly appreciated, especially as they and DNPA Ranger Naomi have their past experience to draw on. Thank you, DWT.